The optoelectronic components mainly consist of electronic devices capable of emitting light or reacting to it. This report focuses on optoelectronic components which are semiconductor devices that are capable of interacting with light. These components have unique features of their own which makes them an ideal choice for a wide range of applications. The optoelectronic components market was valued at USD 32.17 Billion in 2014 and USD 55.53 Billion by 2020, at a CAGR of 9.41% from 2015 to 2020. The target audience for the optoelectronics components market report includes optoelectronic components providers, end users of optoelectronic devices, associations, organizations, forums, and alliances related to the optoelectronics component-based devices, and technology providers. This report details the entire value chain of the optoelectronic components market. It also focuses on the parent market and identifies its potential applications areas. The report covers drivers, restraints, and opportunities for the said market. The report is based on an extensive research study of the optoelectronic component market and aims to identify the market for various applications of optoelectronic components such as LEDs, image sensors, and laser diodes among others. The report covers the overall market and its sub-segments through extensively detailed classifications, in terms of the market size. This report aims to provide a bird’s eye-view of the entire optoelectronic components market with detailed market segmentations, combined with the qualitative analysis of various classifications done on the basis of components, applications, and geography. The market has been estimated and forecast till 2020, in order to estimate its growth prospects and potential. The market has been segmented based on components, applications, and geography. It has been segmented based on components into LEDs, image sensors, laser diodes, optocouplers, IR components, and others; based on application it has been segmented into automotive, residential & commercial, consumer electronics, telecommunication, industrial, healthcare, and aerospace & defense. Automotive, telecommunication, and healthcare are the fastest growing application sectors in the said market. The APAC is the largest market for optoelectronic components and is expected to grow at a CAGR of 9.98% from 2015 to 2020. The said market in China is expected to grow at the highest CAGR of 11.14%; its growth is expected to be driven by growing applications in residential & commercial, and consumer electronics sectors. Available Customization: Detailed analysis and profiling of additional market players (up to five). Optoelectronic components are those which possess the capability to source, detect, and control light. These optoelectronic components are used for a wide range of applications such as for indoor and outdoor lighting, mobile phones in the field of consumer electronics, for fiber optics in telecommunication, for measurement instruments in the industrial sector and many others. Optoelectronic components have the ability to interact with light which makes it ideal to be used in the wide range of applications. The optoelectronic components market is highly competitive and comprises a few leading players from LED & image sensor markets, including mid-tier companies and start-up firms. This research report categorizes the optoelectronic components market on the basis of components, applications, and geography. The market has been segmented based on components into LEDs, image sensors, laser diodes, optocouplers, IR components, and others. The report segments the market based on applications into automotive, residential & commercial, consumer electronics, telecommunication, industrial, healthcare, and aerospace & defense. It has been segmented based on the geography into North America, Europe, APAC, and RoW. 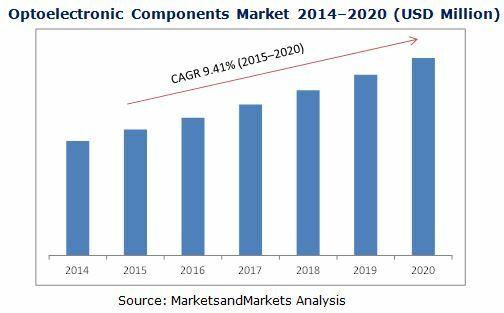 The optoelectronic components market is expected to reach USD 55.53 Billion by 2020. Residential & commercial, consumer electronics, industrial, and healthcare are the major sectors for application of optoelectronics components. In 2015, the residential & commercial sector accounted for the largest share of nearly 28.6% of the optoelectronics component market. The report also details the high-growth regions, thereby underlining the growth trend in the optoelectronic components market. Furthermore, the report analyzes the competitive scenario, geographic trends, and opportunities in the macro- and micro-markets with respect to North America, Europe, APAC, and RoW. The optoelectronic components market is expected to grow at a CAGR of 9.41% from 2015 to 2020. The said market in APAC is expected to witness the highest growth due to the increasing demand of LEDs, image sensors, and laser diodes component for major applications in sectors such as residential & commercial, consumer electronics, and industrial in this region. Major players in the optoelectronic components market include Cree, Inc. (U.S.), Osram Licht AG (Germany), Vishay Intertechnology, Inc. (U.S.), ON Semiconductor (U.S.), OmniVision Technologies, Inc. (U.S.), Sony Corporation (Japan), Sharp Corporation (Japan), Samsung Electronics Co., Ltd. (South Korea), and Koninklijke Philips N.V. (Netherlands) among others.